The teacher for these seminars is Master Faye Yip, Professor Li's daughter and one of the highest authorities on this routine outside China, who will conduct in depth teaching on various aspects and the fine essence of this routine. During this refresher weekend practitioners will learn directly from the source and be able to improve and consolidate their practice. The 42 Step Tai Ji Quan was a unique Tai Chi routine structured by one of the world's famous Tai Chi Masters, Professor Li De Yin. This routine consists of some of the main characteristics and inner essence of four of the five major tradtitional Tai Chi styles, namely Chen, Yang, Wu & Sun Style Tai Chi. This routine was created as a competition routine in 1990 specially for the Asian games. 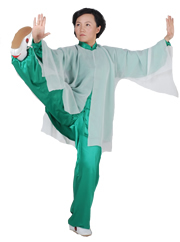 Although designed for competition, due to it's unique qualities, all practitioners of this form can gain good insights into the individual characteristics of the major styles of Tai Chi. Hence it has attracted world wide interest and adherents. Furthermore, this routine consists of some of the representational movements from the 4 main styles of Tai Chi and through this seminar, instructors / enthusiasts can get an overview of the similarities and differnces bewteen various styles. It is suitable for enthusiasts of 42 step Tai Ji Quan at all levels.